Big in Japan! ...Or not. : So, I'm currently using the bed stairs as my desk. So, I'm currently using the bed stairs as my desk. I finally have some photos of our place! Mum's been harassing me for them since we got here. Ahahaha. Now, our place is reeeeally small. Like, 23m2 small. 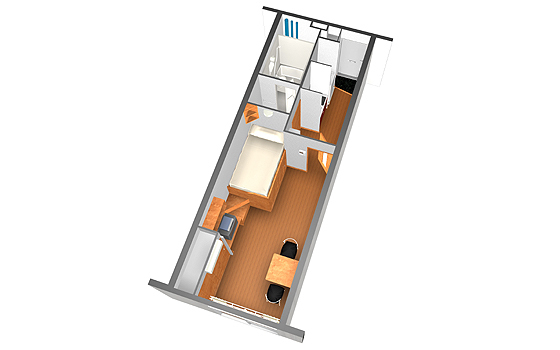 This is a room layout to give an idea. Yep. Pretty small, eh? But, I digress~ So, here we go. Our apartment is called フルールヴィル which is katakana for Fleur Ville. It's a nice place and like I keep saying, it's in an awesome spot. We couldn't ask for a better location. I just wish we had a bit more kitchen space! Welcome to my kitchen. Notice anything strange? That's right! I have NO COUNTER SPACE! Like, none. At all. I've been using my laundry machine as my counter top. True story. I used the stove as my counter when it's turned off, though. It's got glass on top and the burners are under it, I guess. Kinda like what mum has. I had to take two photos, since my back was against the bathroom wall. Our bathroom has a tub and shower and a potty, which is not shown. It's just a plain one. No heated seat. Darn. But, we have to use our shower area for our laundry drying area! There's even a fan installed to blow heated air on it to get them dry faster. One thing I will say is that there's a LOT of storage space! However, we only have one desk and that's where all the outlets are. So, I'm currently using the bed stairs as my desk. Oh well. We're currently using a really old futon. It's really thin. But, it's a bed, so we'll be grateful. And now, I thought I would do a walking tour so that you can get an idea of the size~ Enjoy! I'd like to also draw attention to my lunch. I've been practicing my kanji a little and I decided to practice using my lunch. I had myself a very yummy ham sammich with the kanji for Arashi done in mustard. Yep. I'm awesome. Aah, that reminds me of my very first apartment! I was lucky enough to move in to a bigger place with my boyfriend after a year or so, but I have to say that smaller apartments are easier to take care of, I think.